The Parable of the Good Samaritan was given by Christ to teach us about how to recognize and to relate to our neighbor with a Godly heart, “for it is more blessed to give than to receive” (Acts 20:35). 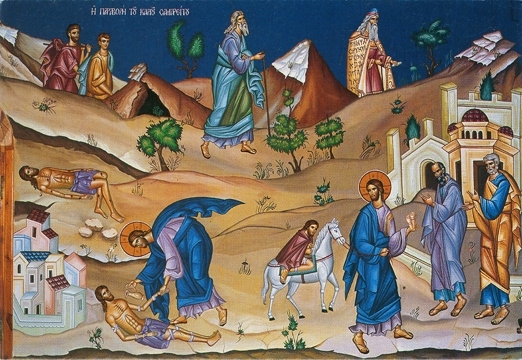 Although the Samaritans were a Jewish sect that had deviated from properly following the Mosaic Law, the Lord Himself said to the Samaritan Woman, St. Photini, that “Ye [Samaritans] worship ye know not what: we [Jews] know what we worship: for salvation is of the Jews” (John 4:22) and not from the Samaritans. Yet in God all our our neighbors are in the fallen state that we all share in our humanity. They, like us, are wounded too. When we see the woundedness and pain of others with a heart full of love and compassion, then we are entering into a state which resembles in our own limited way the mercy and compassion of the Living God, Who sees all beings that He has created, whether they do good or do evil, as dear to His Heart. Godly Love is unconditional, yet adjusts Its expression according to the receptivity of each person. May we learn from the Lord how to recognize our neighbor in each person we encounter, and truly love them.